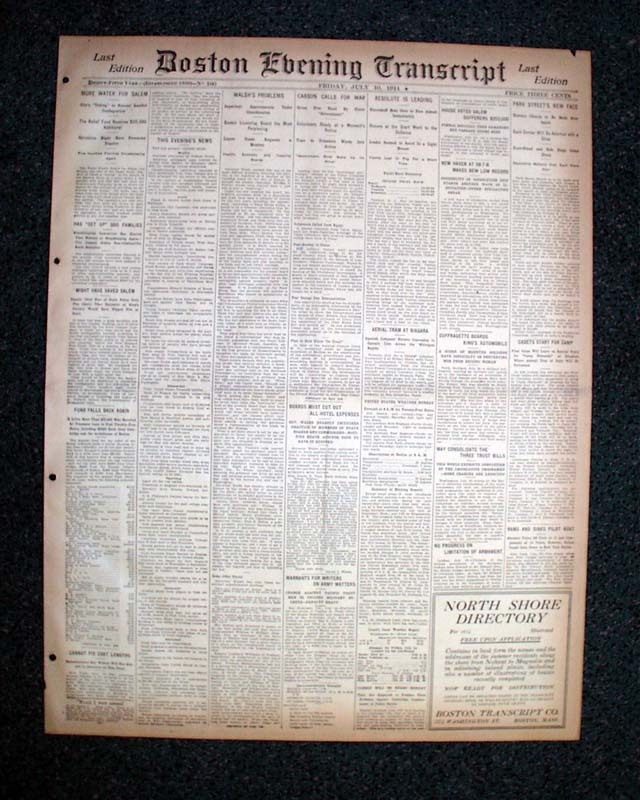 This is an absolute gem of a newspaper for any collector of baseball history. 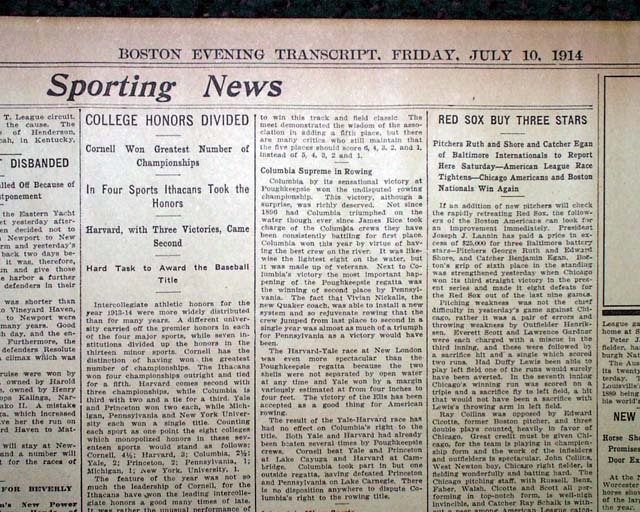 It contains, somewhat inconspicuously on the back page, a report of incredible significance: the purchase of Babe Ruth by the Boston Red Sox, reported in a Boston newspaper. 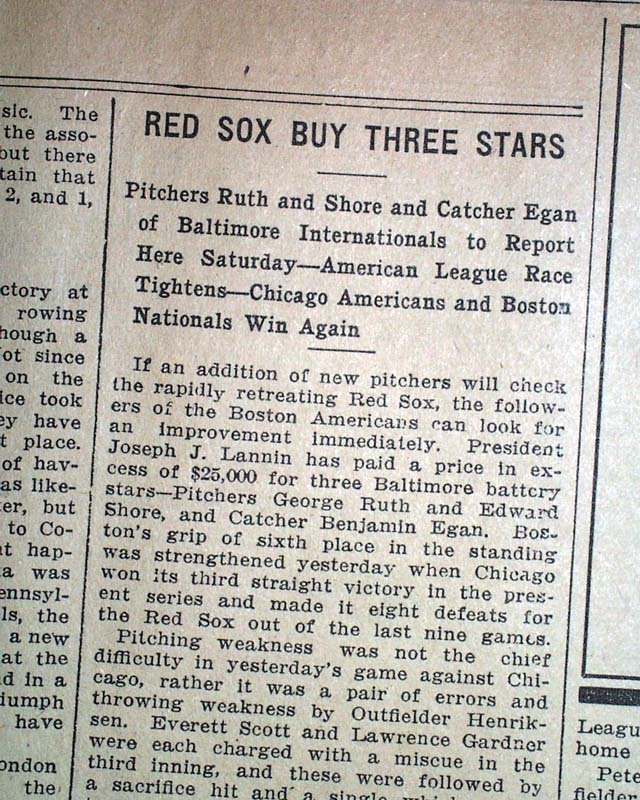 The top of the fifth column has heads: "RED SOX BUY THREE STARS" with subheads: "Pitchers Ruth and Shore and Catcher Egan of Baltimore Internationals to Report Here Saturday--American League Race Tightens--Chicago Americans and Boston Nationals Win Again". 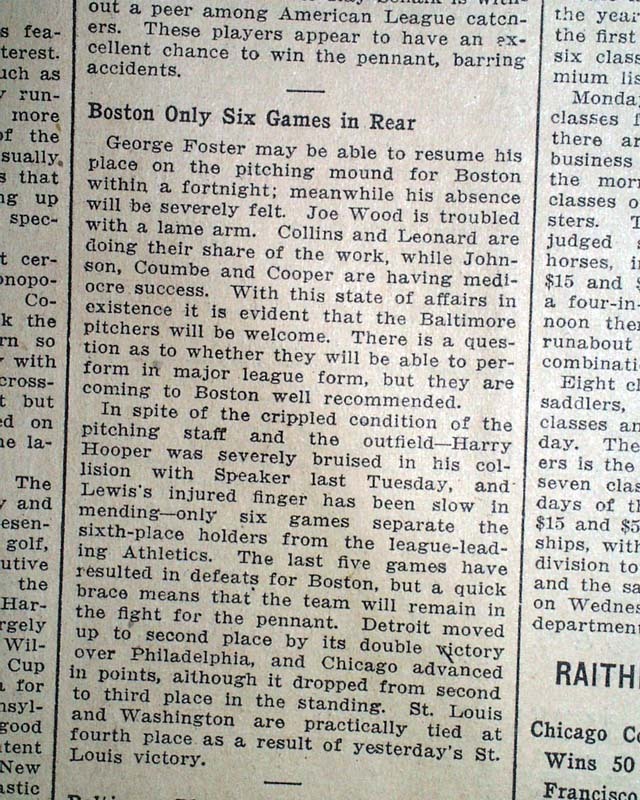 The report reads in part: "...the followers of the Boston Americans can look for an improvement immediately. 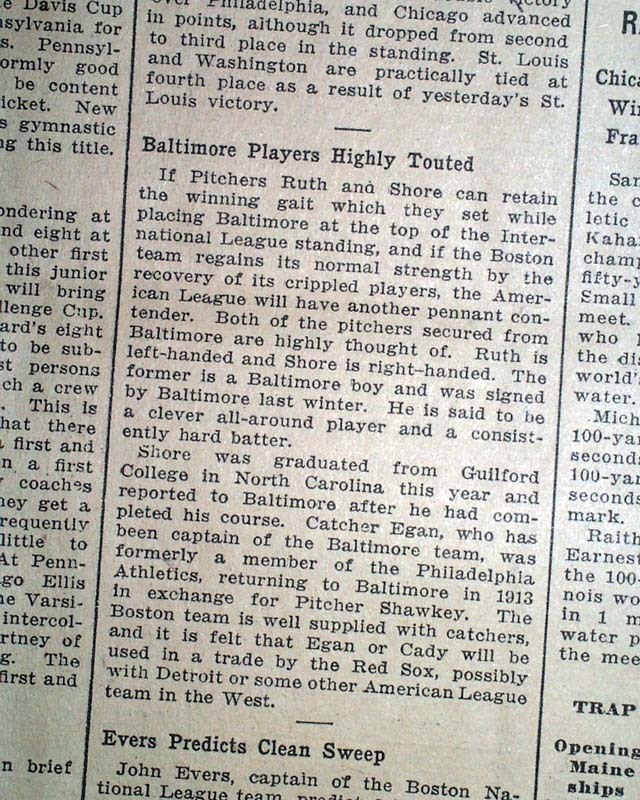 President Joseph J. Lannin has paid a price in excess of $25,000 for three Baltimore battery stars--Pitchers George Ruth and Edward Shore, and Catcher Benjamin Egan..." with more on this. 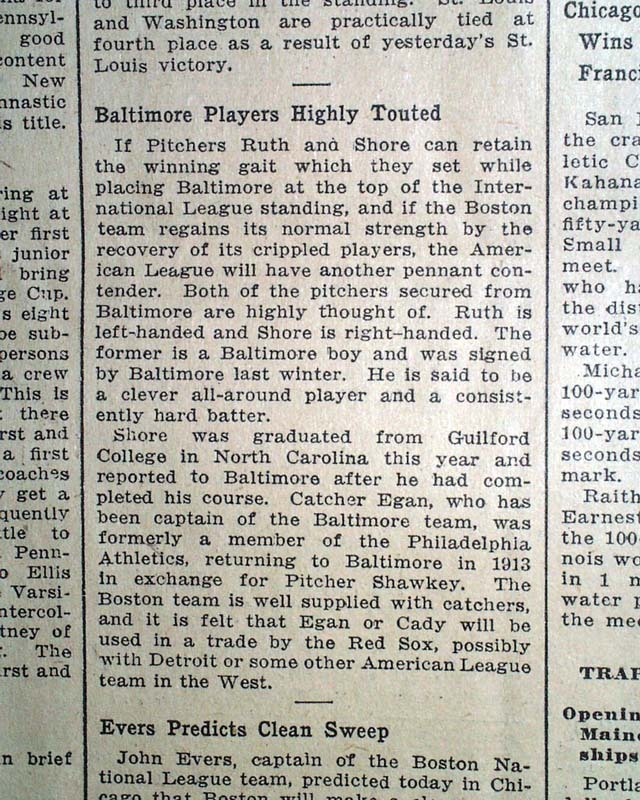 Further on is: "...If Pitchers Ruth and Shore can retain the winning gait which they set while placing Baltimore at the top of the International League standing...the American League will have another pennant contender. Both of the pitchers secured from Baltimore are highly thought of. Ruth is left-handed and Shore is right-handed. The former is a Baltimore boy and was signed by Baltimore last winter. 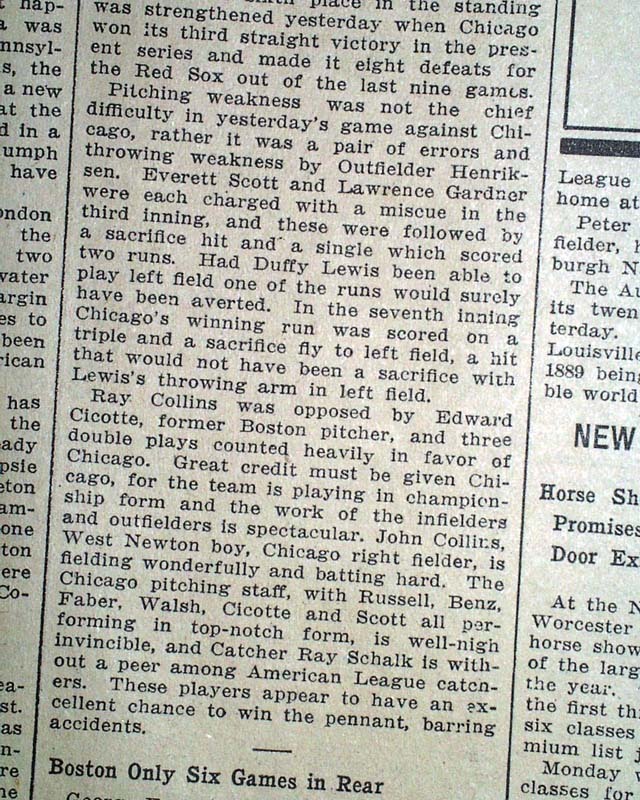 He is said to be a clever all-around player and a consistently hard batter...". A terrific issue and a foundation piece for any collector of Babe Ruth memorabilia. Rarely found. Complete in 12 pages, 4 binding holes at the blank spine, evenly toned, some minor margin chips or tears, generally in good condition. Fragile & should be handled carefully.